Review: A medical engineer and an astronaut are in space. It is the first time the medical engineer has been out on the shuttle mission. They run into trouble and the shuttle gets destroyed. They are now left on their own. This is a film that I highly recommend going to see in 3D. I think it works really well for this type of film. The visual effects were amazing. It is only 90 minutes long which I liked, so not too long. The fact that it just concentrated on one story and didn’t go off on something else was good. It could have easily lost its way. 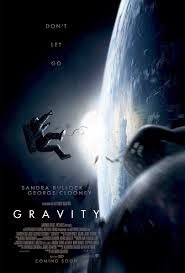 This is one of Sandra Bullock’s best films. She did an amazing job. I don’t think she will get an Oscar for this film but I would like her to be nominated. George Clooney didn’t have much of a part to play. Sandra Bullock spent 6 months in physical training. The director came up with this idea four years ago but had to wait for the technology to improve. At the Golden Globes in 2014 Alfonso Cuaron picked up an award for Best Director – Motion Picture. This won 6 awards at the Baftas in 2014. They were for Outstanding British Film, Best Director, Cinematography, Music, Sound and for Visual Effects. At the Academy Awards this won 7 awards also in 2014. The Oscars went to Best Director, Best Cinematography, Best Editing, Best Music, Best Sound Editing, Best Sound Mixing and Best Visual Effects.